When chicken and cashew nuts are mentioned together, the dish that comes to mind is Kung Pao Chicken complete with dried chilies for spiciness. However this combination as I have discovered, can also be made into a delectable curry when done using korma spices. Korma is a popular dish that originated in the Indian sub-continent but made its way along the monsoon trade routes to Southeast Asia many centuries ago. 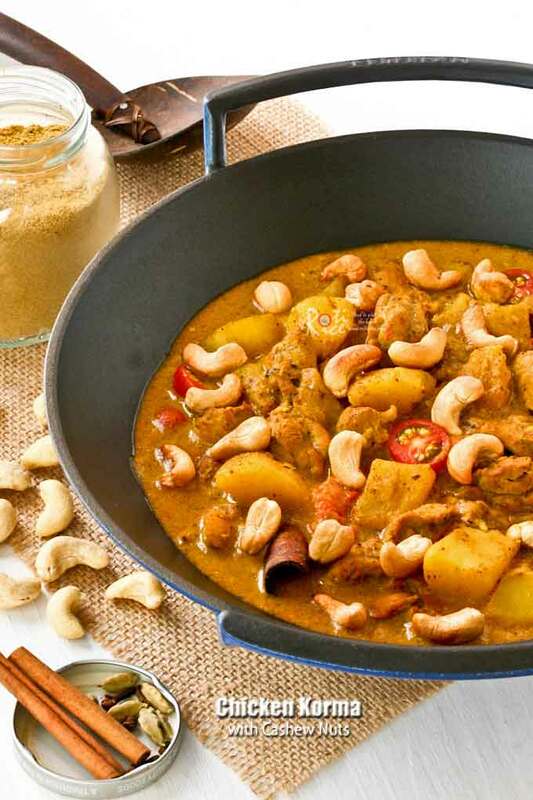 This Chicken Korma with Cashew Nuts can be made mild or spicy depending on one’s preference. Furthermore, it can be combined with chicken, mutton, lamb, or beef. Specifically in Malaysia, korma is normally mild and fragrant as a contrast to the sharper and spicier local curries. It can be a “starter” curry for beginners and many kids have their first taste of curry in the form of a korma. For many years, this curry was not present in restaurants and could only be found in homes during a kenduri or Malay feast. It grew in popularity along with other Indian Muslim food in the 1980’s. Today, it has taken its rightful place on the menu with the rest of the Malaysian curries. 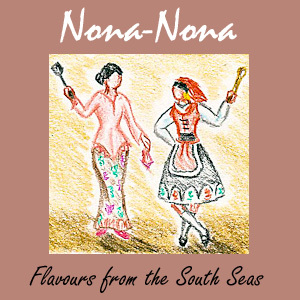 If you are a frequent visitor to this blog, you probably already know that Nona-Nona is a monthly virtual cooking collaboration between my blogging buddy, Denise and me. We take turns to select an ingredient or theme to cook a dish and post simultaneously on our respective blogs. Neither one of us know what the other is preparing but since we come from similar backgrounds there is always the possibility of us preparing the same or similar dish. So far, this has happened twice. You can read about it here and here. The theme for this month, CASHEW NUTS was selected by Denise. 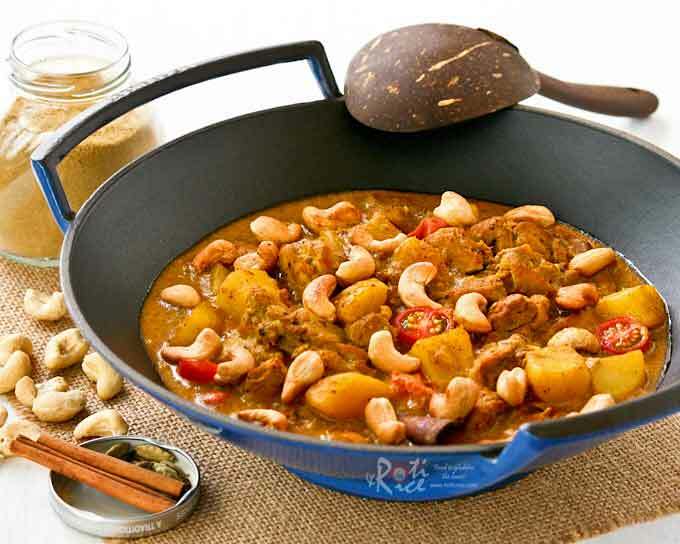 Roasted cashews are often eaten as a snack in Malaysia but they are seldom used as a main ingredient in cooking. Sometimes, it is used in place of buah keras or candlenut as a thickening agent in curries. 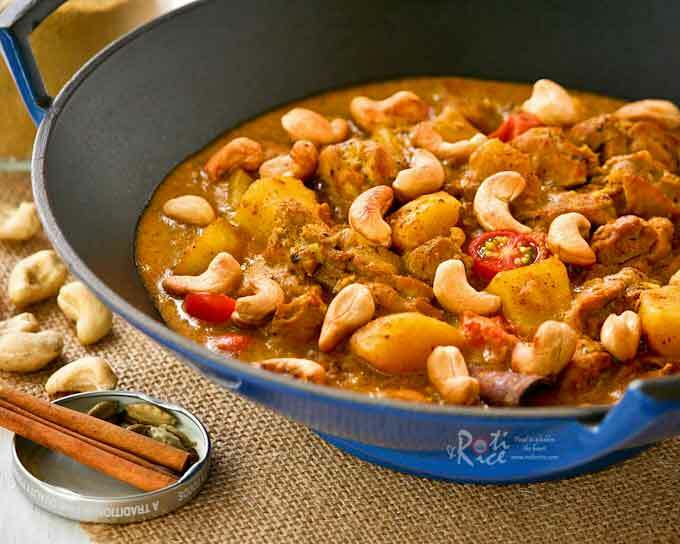 In this particular curry, I used ground raw cashews in the sauce to make it rich and creamy. The roasted cashews added at the very end, provided a nice contrast of textures. It is delicious served with steamed basmati rice and mango or lime chutney as a counterpoint to the creaminess. Combine all spice paste ingredients in a bowl with 3 tablespoons of water to form a paste. In a medium sized pot, heat vegetable oil. Fry cinnamon stick, cardamom pods, and cloves for 1 to 2 minutes or until spices start to pop. Add onion, garlic, and ginger and fry for another 2 minutes. Then add spice paste and continue to cook for 4 to 5 minutes over medium heat. Stir constantly so that the spices do not burn. Now, add chicken and continue to cook for another 4 to 5 minutes. Pour in ½ cup (120ml) water, cover, and bring to a boil. Reduce heat and allow it to simmer for 10 minutes. Season with salt to taste. Add potatoes and continue to cook for 10 minutes. Finally, add tomatoes and stir in yogurt. Allow it to simmer for about 3 minutes. Turn off heat and let korma sit for 10 minutes. Sprinkle roasted cashew nuts on the top and served with steamed basmati rice. Now, let’s hop over to Singapore Shiok! to see what Denise has cooked up in her kitchen with CASHEW NUTS. Wow! Your korma looks absolutely mouth watering! The gravy must be very luxurious because of the cashew paste. I would love a plate of perfectly cooked basmati rice, korma and pickle. Glad that at least, we didn’t do exactly the same curry. Looks gorgeous Biren, nothing like home made norma! Love the abundance of cashews. Is that the new Marseille colour from Le Creuset? I love their new blue but I have so much in Volcanic, I don’t know if mixing it will work! Oh yummy! I love kurma dishes as they have less heat because less chilli is added so I can eat more without breaking out in sweat lol! Yours looks so delicious! Biren, this is perfect timing! I have just run out of store bought Korma curry powder, and here is your recipe to make it from scratch. I have all the spices in the store cupboard, definitely will be trying out your recipe very soon. The curry looks amazing and my kids do enjoy korma very much. Definitely a luxurious twist with the cashew nuts! Thanks for the recipe.